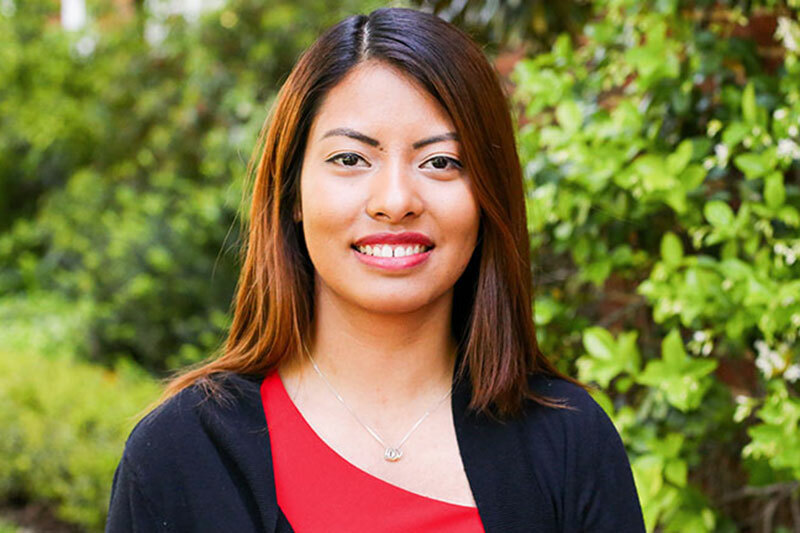 Aarusha Shakya, '16, made the most of her Meredith College experience, completing two majors, multiple internships, and studying abroad, all while maintaining her place on the Dean's List. Aarusha, who is from Kathmandu, Nepal, has earned degrees in economics and business administration, with a concentration in human resources and a minor in finance. In the summer after her sophomore year, she completed an independent study abroad program at the London School of Economics. "Studying abroad helped me challenge myself and step out of my comfort zone. I learned to adapt to a new environment and how to understand business practices from a European perspective." Another way she learned new skills was through internships at the Equal Employment Opportunity Commission (EEOC) and at Grifols USA. During her EEOC internship she was taking an employment relations course at Meredith, which doubled her opportunity to learn. "Every time I read something about human resource laws in class, I would be able to apply it to the internship, and every time I learned about new cases at the internship I had practical knowledge about the theory I learned in class." Aarusha has been an officer in many organizations for business students, including vice president of the Meredith Accounting and Finance Association, vice president of publicity for the Society for Human Resource Management (SHRM), and a member of the Student Business Advisory Board. As a SHRM member she has attended the organization's regional and national conferences. She was also a speaker at Meredith's TEDx event in 2014. She credits faculty support for helping her succeed. "They recognize your potential and guide you through things you never thought you could do, and make the impossible possible. Now I'm confident when experiencing anything new, including traveling, presenting in front of a large crowd, organizing events, and networking with professionals." While her academic activities kept her busy, Aarusha found time to participate in Meredith traditions. Her favorite experience was at Ring Dinner. "The ring always reminds me how shy I was as a freshman, and how I have grown to be a strong woman ready to enter the professional world."